Here are a couple of Coach Schiano's pressure concepts from his time with the Tampa Bay Buccaneers. 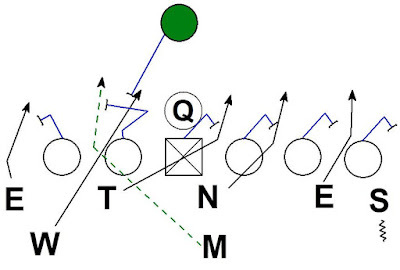 I'm curious to see if these are similar to the pressure concepts that show up on film at Ohio State next season. 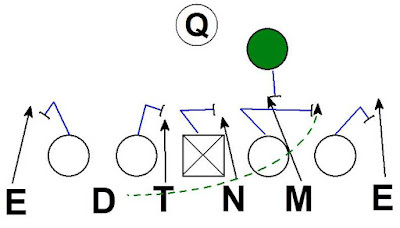 This post focuses on green dog* overload concepts designed to create a 2 rusher vs. 1 running back overload. Mike is the green dog player. His coverage responsibility is man coverage on the RB. As the RB blocks the rushing Will the Mike joins the pass rush. 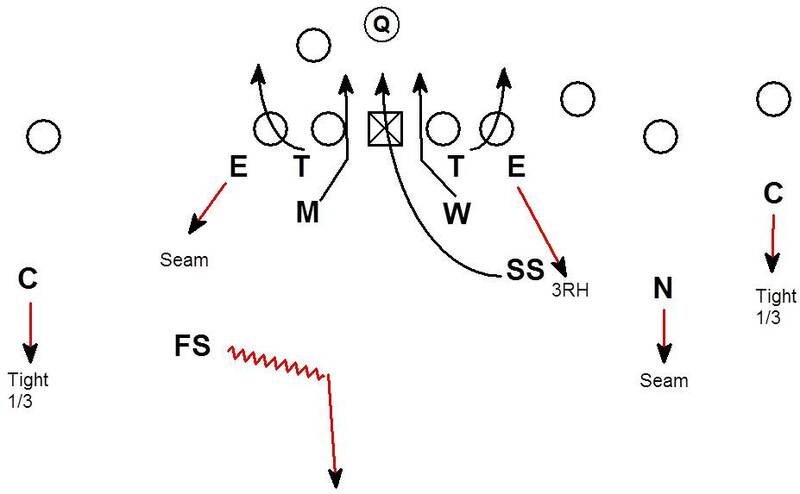 The effect is 2 rushers through the B gap and a 2 on 1 vs. the RB. 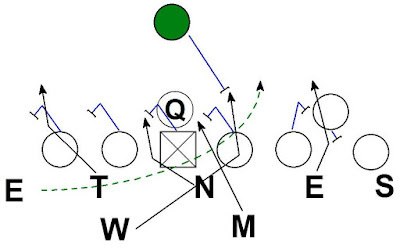 The offense is in a 7 man pass protection and should have good numbers to block the defense. 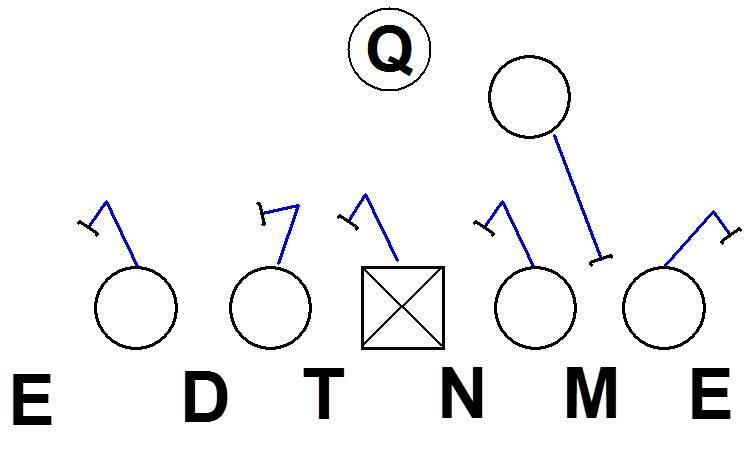 To the right the offense has 4 (TE, OT, OG, C) to block the 4 possible rushers to the right of the Center (Sam, DE, Nose, Mike). 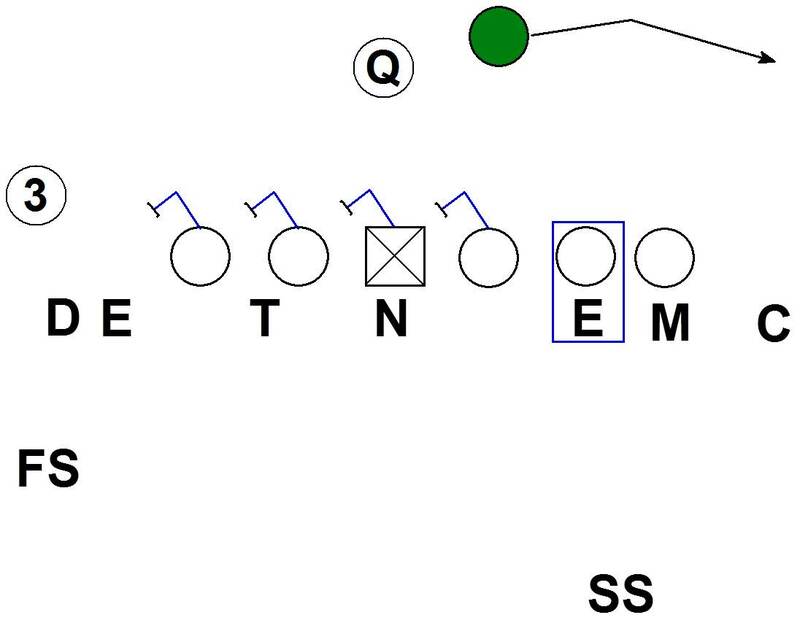 To the left of Center the protection has RB for Will and the OT and OG for the DT and DE. The issue is the LG is setting on the DT and initially is responsible for the DT on the inside move to the A gap. Once the DT keeps going to the opposite A gap the Guard can pass him off. By the time the OG realizes the DT needs to get passed off, he doesn't have time to redirect and block the Mike. 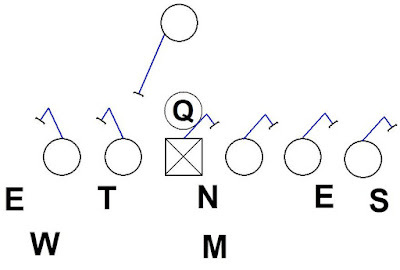 The protection uses 5 (G,C,G,T,TE) to block 3 (DT, Nose, DE). Here is another example from a dime sub personnel package. Dime is the green dog player. The Dime shows pressure in his B gap and loops to the block of the running back post-snap. The effect is again a 2 on 1 overload on the RB in the B gap. The the offense is in a 6 man pass protection. The LG sets to block the Dime while providing body position on the DT in the A gap. The Center is in a bind here. He must snap the ball and hit a pass set with 2 DT's aligned on him. The Guards need to help him or risk an interior double bull rush in the middle of the protection. #2 The LG was body positioning and helping the Center, which left the RG 1 on 1 with the Nose. The RG took an aggressive set to block the Nose. Having the RG come off the aggressive set and redirect to the Dime is very difficult. 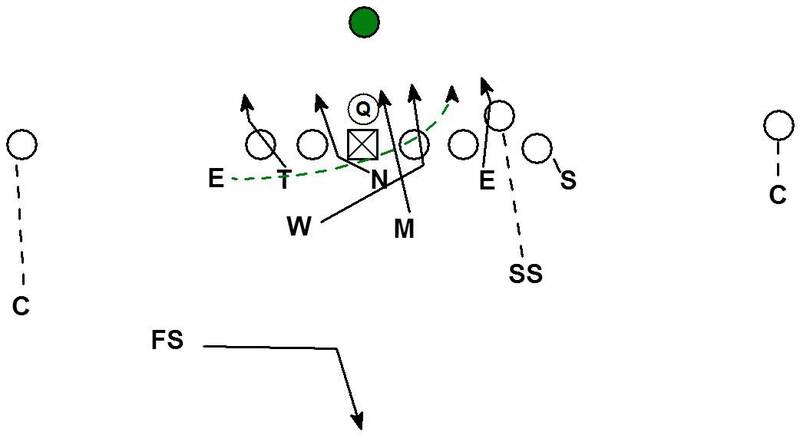 #3 The RG on a redirect would have to set through the traffic of the RB blocking the Mike. 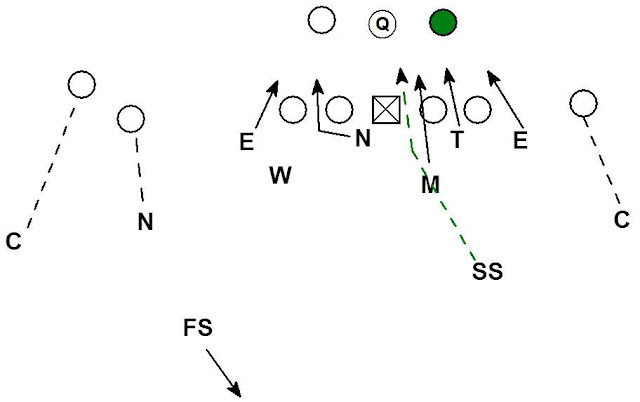 #4 If the G,C,G screw up on the redirect the result is an interior DL on a run through to the QB. Basic rule of pass pro is to always protect the shortest path (inside straight line) to the QB. 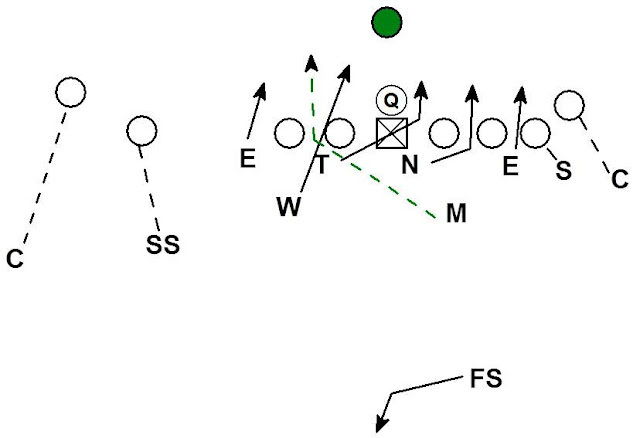 Here is an example using a deep safety as the green dog player. SS is the green dog player. SS adds to the rush from depth as the RB blocks. Here is an example using the a DE as the green dog player. DE is the green dog player. 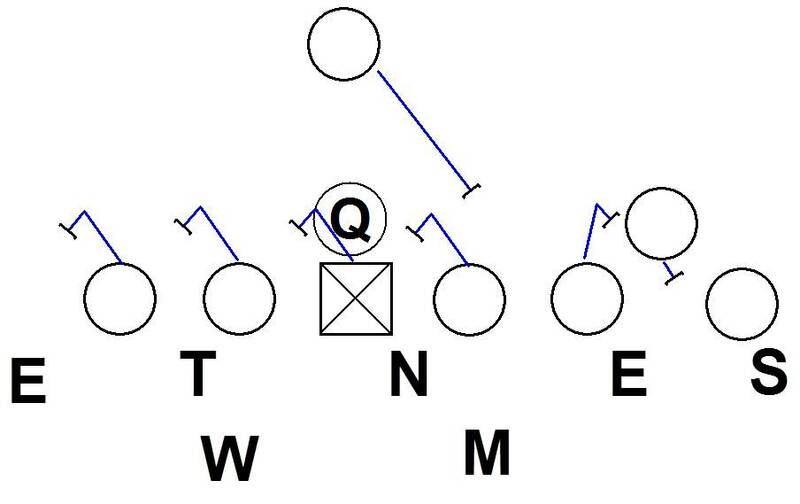 The offense is in a 7 man protection and has the numbers to block all 7 possible rush threats in the core. By looping the DE the protection is forced into very difficult blocks. 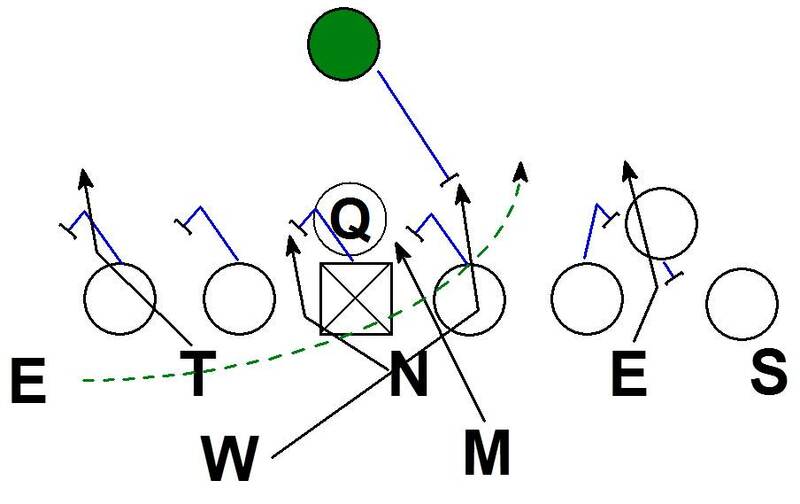 The guard ends up 1 on 1 against the rushing Mike because the Center is occupied with the Nose. The Will and End have a 2 on 1 vs. the RB. The offense could again try to redirect to pick up this rush but the complexity level to identify what is happening is very high. Also redirecting to pick this pressure up would require tremendous athleticism by the OL. Here is a good example of the defense using the green dog while doing a good job of disguising where the pressure is coming from. DE is the green dog player. 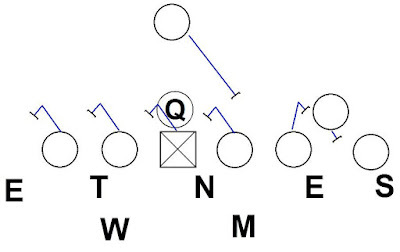 The DE is aligned in a 2 point stance as has a edge rush demeanor. 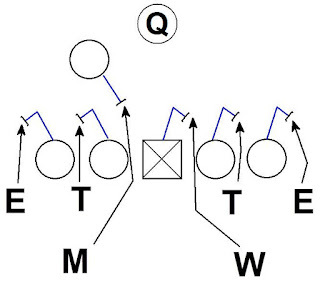 The offense is in a 5 man protection with the RB free releasing into a swing route. 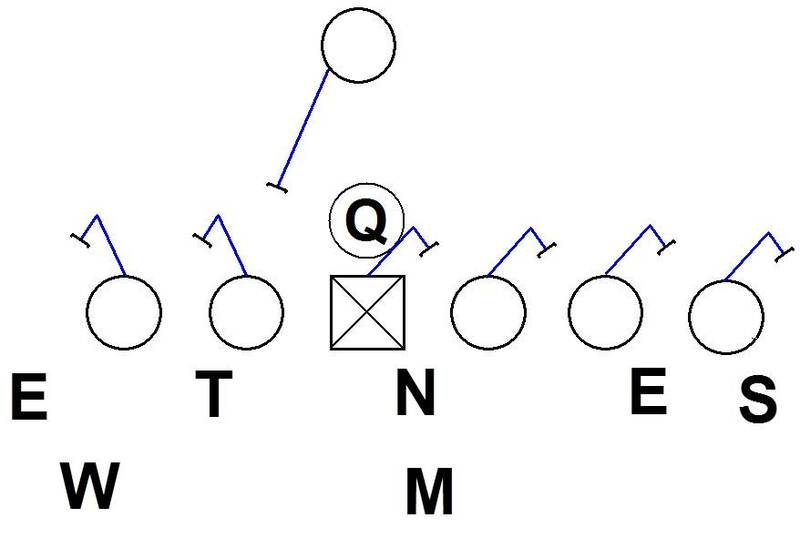 The 5 OL must block the 5 most dangerous rush threats. In this case the defense bluffs pressure from the Dime. Here the Mike shows by alignment and demeanor that he is man to man on the TE. 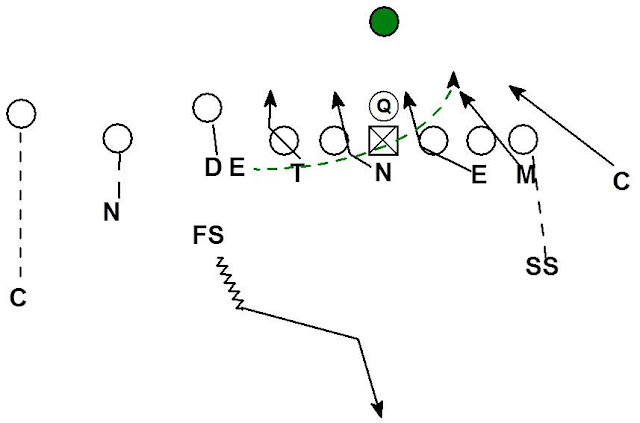 The SS is deeper than the FS who is cheated down with eyes on the #3 receiver. Every indicator is the the Dime and End are rushing off the edge with the coverage rotating to cover for the rushing Dime. 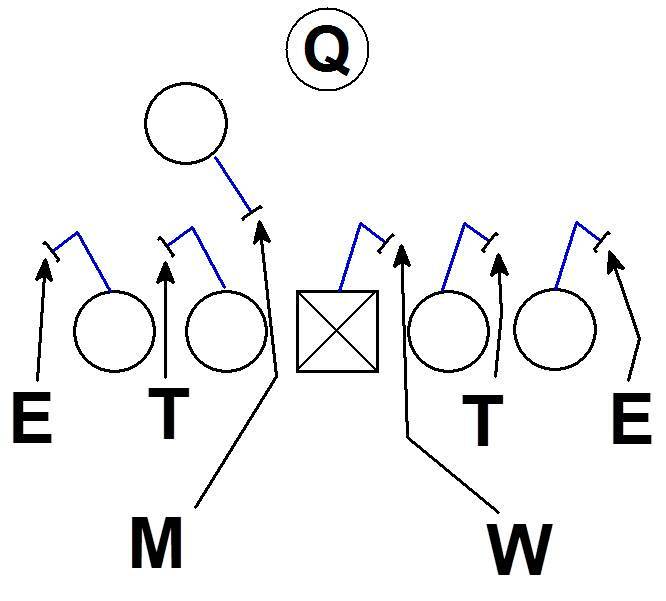 The OL points and adjust accordingly to slide the protection to the Dime leaving the back side OT man to man with the DE. During the cadence the SS tightens down to play man on the TE. The FS pops out to play the MOF. The Dime plays man on the #3 receiver. The Corner was rushing off the edge and peels to cover the RB on the swing or flare route. 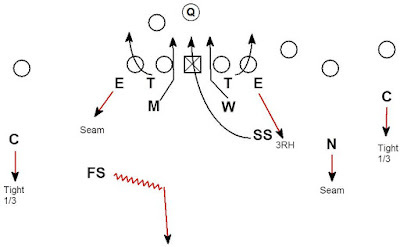 The corner must use this technique to avoid the giving the DE no shot to cover the RB on the swing. The OT is man to man on the long stick DE. There is no one to pick up the Mike rushing in the C gap. Once the OL had declared the 5 most dangerous rush threats it is very difficult for them to redirect an block rush threats coming from the opposite side. 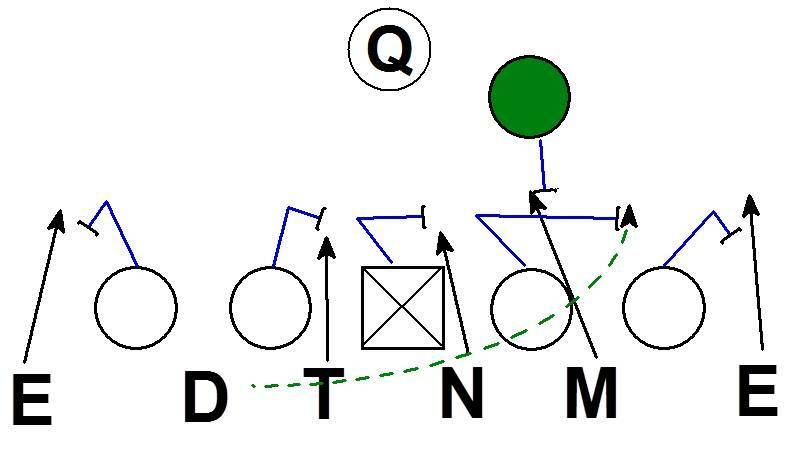 This is a 5 man middle overload zone dog Coach Bowles dialed up when he was the defensive coordinator for the Arizona Cardinals in 2013. The pressure is run from a nickel personnel. The pressure overloads the middle of the pass protection. The expected reaction from the pass protection is for the OG and OT on both sides to fan out to block the DE and DT on either side. The Center has one A gap rushing LB and the RB has the other. The DT's working through the B gaps holds the attention of the guards. If the DT's immediately looped outside the OG could possible squeeze the protection back to the middle. The occupation of the OG's creates the 3 (Mike, Will, SS) vs. the 2 (Center & RB) overload inside. 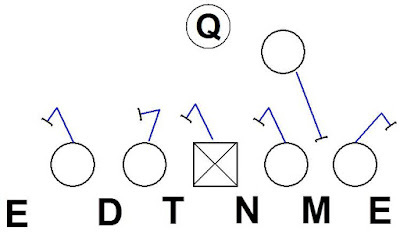 The OT's are left pass setting to no one with both DE's dropping into coverage. It would be very difficult for the OT's to provide any help to the midline. For the offense to squeeze the protection back inside, many reactions would need to happen very quickly. 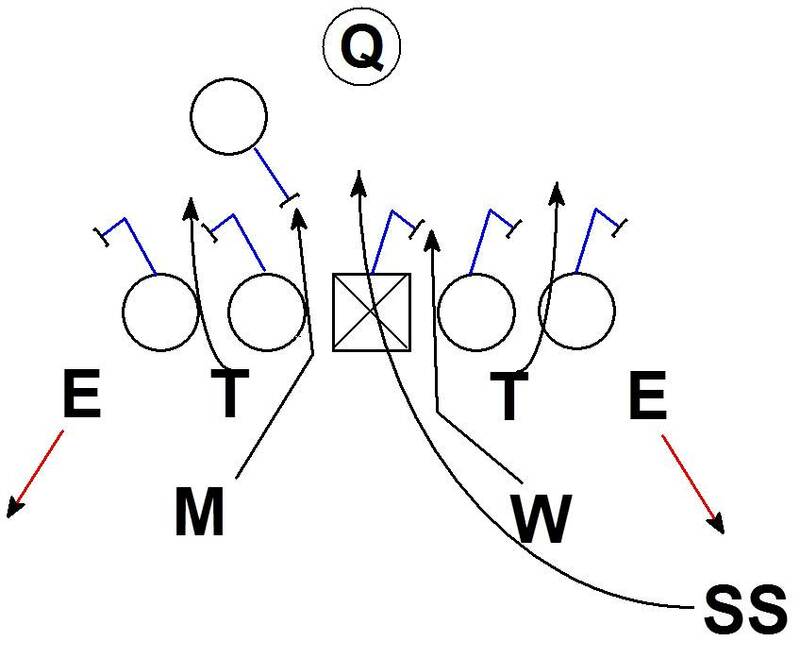 The Center, Guard, and Tackle would all have to redirect from their initial pass set. This would require all three to identify the DE is dropping. The ID would also force all three to communicate and react in unison to squeeze the protection. They must also must each physically handle the athleticism required to redirect their pass set and make an effective block. All this with full speed rushers coming at them.